Looking for green living room design ideas? A dynamic and refreshing colour, green comes in many different shades, from the formal and cool sage to bright and cheerful emerald or deep and relaxing teal. And – green goes well with whites, creams, and greys, which are the staple colours of living room design. 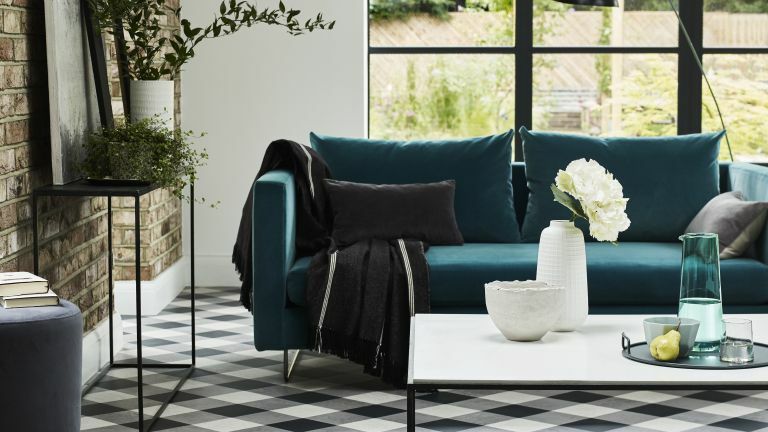 From accent furniture pieces to all-over green colour schemes, we guide you through the best ways to transform your living room with green this season. And when you're done browsing, get more practical advice on how to design a living room. A bright emerald mid-green is the perfect colour to take a room that's crying out for an update to the next level. Choose bright green paint for maximum impact, or use a wallpaper for a softer look that's more suited to a traditional living room design. This living room has been decorated with Tessella wallpaper by Farrow & Ball. Want to see if green will work in your living room or add a focal piece of furniture in a complementing tone to a grey living room? Start with a green armchair or sofa, which will add a subtle, softening contrast to darker or neutral shades. Love this? See more grey living room design ideas; and don't miss our pick of the best velvet sofas (in all colours). The Balfour Sofa is from Sweetpea & Willow. Our top design tip for dark, north-facing living rooms is to pick vibrant, juicy green shades that won't be washed out by the lack of daylight. These colours really come into their own in darker rooms, looking rich rather than garish. Paradoxically, bright colours also make small space feel larger, so an all-over green shade will work well in a small living room. This green living room has been painted with Little Greene paint. Find out more about how to design a north-facing living room in our guide. If you prefer a neutral decorating scheme, go for muted green shades such as sage or mossy green. If in doubt, pick shades that lean more towards grey or blue for a more understated effect. Again, these tones of green look wonderful matched with greys. This muted green living room design scheme is by Ikea. Large and airy living rooms tend to do better with brighter, more neutral colour schemes, and can be drowned out by very bright colours. So, if you have a large space and are looking for green living room design ideas, a wallpaper with a delicate green pattern will be your best bet. This living room has been decorated with the Hassel wallpaper by Sandberg. We have more statement living room wallpaper ideas if you love this look. This is not an absolute rule by any means, but cool greens tend to be suitable for creating a smart, formal design scheme. This traditional living room benefits from a cool green shade that's brighter than sage, but less demanding than a bright emerald. For a similar shade, try Emerald Glade by Dulux. See more gorgeous traditional living room design ideas in our gallery. If yours is a country style cottage – or you'd love to create a cottage look – a small repeat floral patterned wallpaper in green is a fabulous choice. Match it with dark woods and furs for a cosy, welcoming feel. Dark floors and dark furniture tends to create a formal look, so if you're looking for green living room design ideas to suit a more traditional – or vintage-style – living room, pick a tone that matches the dark wood shades, but ensure you add touches of warmth in richer, hotter colours with the addition of accessories, such as rugs. Turquoise can lean either more towards blue or more towards green, but it always evokes summer and warmer climes – perfect if you want a more Continental vibe in your space. Add further warmth by choosing furniture in bold, warm shades, such as sunshine yellow – here, the upholstery picks out the lighter tones of the wallpaper design. Find out how to choose the best living room furniture. If your living room has a contemporary look that you want to keep subtle and stylish rather than bold, pick a piece of furniture in a deep, petrol green, rather than a louder, apple shade. It's the perfect complement to industrial materials, such as metal-framed windows and exposed brick walls. Find out how to create a feature with an exposed brick wall; use our buyer's guide to metal windows and doors to pick the right ones for your home, too. Olive green is such an easy, elegant shade of green to live with, but what if you want to give your colour scheme a little more punch? One way to do so is to pick furniture in bolder colours – and if you are really clever, you can add two accent colours (as below) at the same time. Here, the main accent shade is gold – seen in the sofa and accessories; the pastel pink makes a single appearance, perfect for maximum impact. Find more pastel room decorating and design ideas if you love this look. If you want to put green on one wall only, picking a large repeat print green wallpaper will create lots of impact. You can match this type of wallpaper design with all kinds of furniture styles to create the type of room you'd like; here, it's the perfect backdrop to Mid-century modern furniture. Find more tips for creating a Mid-century modern living room in our guide. Ask a colour psychologist and they'll tell you that green is the most restful of shades; add an element of nature to your room's design, and you'll maximise the effect. So, if you're after green living room design ideas that will create a restful haven, a leafy green wallpaper (or curtains, or upholstery fabric) should be your go-to choice. Push home the point by doubling up patterns, prints and colours, as here with the sofa/wallpaper combination. Find out how to mix patterns and prints in our guide. If you're feeling particularly adventurous, then you may want to introduce another bold shade to your green living room scheme. Our tip is to use just one wall, or part of a wall, for your 'wild card' colour. This living room juxtaposes green and pink paint shades from Little Greene. If your living space is open-plan, you may want to try zoning it into different areas with the help of different colours. Our advice is to use harmonious or contrasting colours to create a colour scheme that is vibrant yet coherent. This living room uses Green Smoke and India Yellow by Farrow & Ball. Get more advice on how to use a colour wheel for interior design in our guide. Go for green blinds or shutters in order to create a relaxed atmosphere in the living room – green window treatments will help colour gently stream into the room, and you can keep the rest of the design scheme neutral. We have more living room window dressing ideas for your to browse. Teal is another chameleon shade that can lean either towards green or towards blue, and can sit right in-between. It's a great option for creating a dark and atmospheric design scheme in your living room. This living room combines a teal wallpaper from Farrow & Ball with dark flooring and warm Mid-century furniture. We think it all works beautifully. Explore more dark and atmospheric decorating ideas and Mid-century decor ideas. Plants are the easiest of ways to create green accents in your living room – and they add plenty of texture, too. Combine trailing and upright plants for maximum effect, and explore our tips for transforming your home with house plants for more ideas. The Betty armchair is from Sofa.com. If you've installed wall panelling in your living room, picking a shade that might have been typically authentic will give it a smart, period feel. We love grey green which, matched with black, creates a sophisticated feel. However, we'd always advocate adding a splash of warmth in furniture or accessories, with red/pink being the perfect colour contrast. Looking for green living room design ideas to enliven an all-white living room? A green accent wall is a great place to start. Pick an easy-going pale green shade if you prefer a more understated look. This airy living room with a green accent wall features fitted storage by Neville Johnson. Find more white living room design ideas in our gallery. Want more colour-related design ideas?